Listening again to the podcast (see the foot of this post) of an exchange between Enzo Bianchi (the prior of the Bose Monastery) and Gustavo Zagrebelsky (an ex-member and ex-president of the Italian Constitutional Court), I was suddenly struck by these few statements by Bianchi in the middle of a much larger dialogue. 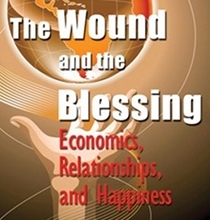 The theme of gratuitousness (la gratuità) is one to which I am particularly attuned since my translation of Luigino Bruni’s The Wound and The Blessing: Economics, Relationships, and Happiness (La ferita dell’altro: economia e relazioni umane; forthcoming in English from New City Press). Gratuitousness is the central term in that book; Bruni asserts the value of gratuitousness as the expression in the market of a more general agapic love. Bruni argues generally for reciprocity in markets, as opposed to either of the polar opposites of self-interest and altruism (other-interest). We meet in the market in order to exchange because we need a good the other has, whether a product or a service, and others need something we can offer. In this sense reciprocity is a recommendable paradigm of economic activity, as we exchange in ways that, at least to some extent, takes into account the attitudes and behaviors of the other. However, reciprocity is not a complete paradigm: gratuitousness is needed to alter one’s response when one has been wronged. Being willing to be hurt, absorb the wound, and transform it into a blessing, is the essence of a gratuitous response. In contrast, Bianchi seems to focus on gratuitousness as only contrasted against reciprocity. In a situation in which someone has hurt me, offering forgiveness—not from a position of moral superiority, but as a peer—is in direct contrast with a reciprocal response. In a case of offense, a reciprocal response would be more what we might call revenge, or retaliation—an eye for an eye, that sort of thing. At first it might seem that Bruni’s and Bianchi’s views of reciprocity are somewhat at odds with each other. Bianchi’s view is that gratuitousness is in opposition to reciprocity; for Bruni, they seem more complementary, with gratuitousness filling in the spaces in what are otherwise reciprocal market transactions. On reflection, however, there is no difference in their positions. Bianchi contrasts gratuitousness and reciprocity in a situation in which offense and wound have already happened, and it is precisely in such a situation of wound and offense that Bruni argues for a response of gratuitousness rather than reciprocity. In non-injurious relationships, reciprocity is a good and normal sociality; when the relationship becomes injurious, both Bruni and Bianchi argue for a response of gratuitousness rather than reciprocity.